From the big up Southwestern U department... Thanks to Katie for the shout out! 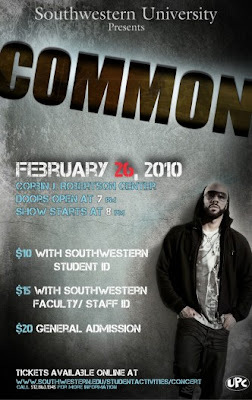 Common @ Corbin J. Robertson Center this Friday, Feb 26th! $10 with Southwestern Student I.D. $15 with Southwestern Faculty or Staff I.D. Lonnie Rashid Lynn, Jr. (born March 13, 1970), better known by his stage name Common (previously Common Sense), is an American rapper and actor. Common debuted in 1992 with the album Can I Borrow a Dollar? and maintained a significant underground following into the late 90s, after which he gained notable mainstream success through his work with the Soulquarians. His first major label album, Like Water for Chocolate, received widespread critical acclaim and moderate commercial success. Its popularity was matched by 2005's Be, which was nominated in the 2006 Grammy Awards for Best Rap Album. Common was awarded his second Grammy for Best Rap Performance by a Duo or Group, for "Southside" (featuring Kanye West) (from Finding Forever), his first awarded in 2003 for Best R&B Song for "Love of My Life (An Ode to Hip-Hop)" with Erykah Badu. His best-of album Thisisme Then was released on November 27, 2007. Common has also initiated a burgeoning acting career, starring significant roles in such films as Smokin' Aces, Street Kings, American Gangster, Wanted, and Terminator Salvation.